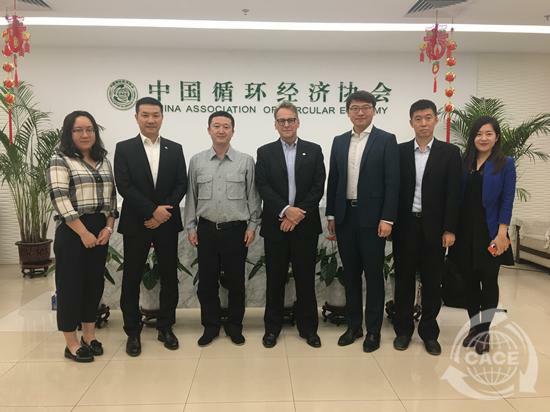 On September 25, 2018, Jeremy Hunter, President of Greater China, Henkel Corporation, visited China Association of Circular Economy (CACE) with the Governmental Relations & Public Affairs Group. Mr. Zhao Kai, Vice President and Secretary General of CACE, welcomed and received the visit. Mr. Zhao Kai briefed on the development status of circular economy in China and the implementation of Extended Producer Responsibility (EPR). The two sides also conducted in-depth discussions on issues such as recycling and utilization of packaging materials and disposal of hazardous waste. At the end of 2015, the European Commission adopted an ambitious circular economy package to stimulate the promotion of European’s circular economy. As a century-old company, Henkel actively responded to the plan. According to Mr. Jeremy, Henkel has now developed the circular economy as one of the core development strategies and formulated its development goals for 2030. The two sides have reached the intention of further cooperation in the field of circular economy.